This picture was painted shortly after “The Nightwatch”, yet it does not have much in common with the bravura and action of the Civic Guards piece. It shows a peaceful Dutch interior, the shutters are tightly closed. Light seems to be the true subject of the composition. Rarely did the artist show himself so peaceful, captured by the play of light on these silent objects. An atmosphere of tenderness surrounds the Child, an enclosed space around which night is falling. Marvellous how Rembrandt could convey grandeur in intimacy. There was no doubt whatsoever that the painting was an autograph work by Rembrandt: who else could depict such peaceful intimacy with only a few touches. A few very simple objects tell of the life that is lived in this room. 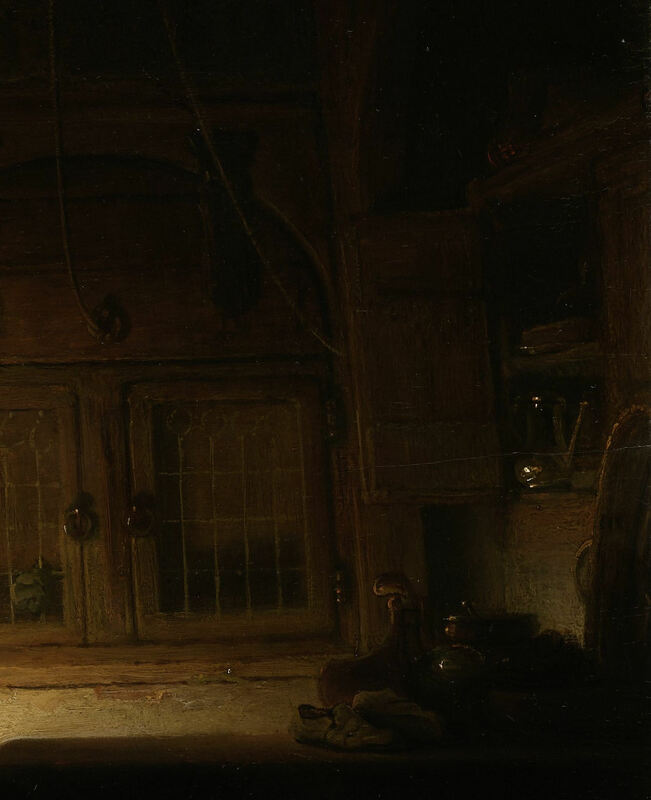 They look like small still lifes within the painting: books on the cupboard and in it a metal saucer and a so-called “Jan Steen jug”, on the table a pair of shoes, a flask attached to a leather belt, a pessel and mortar and a diaper basket. On the wall hangs a map, next to it a wicker basket. Over the hearth hangs a copper lamp. In this rather barren room sit Mary and her mother Anne next to the Christ Child lying fast asleep in his wicker cradle. Anne, who has dosed off, still has the rope with which she has been rocking the cradle in her hand while Mary reads intently. Difficult to see is Joseph who sits crouched under the staircase where he is engaged in tapping some liquid from a barrel. He is the only one who is engaged in any action that may produce sound, but this does not disturb the peaceful scene. The Holy Family by Night was first mentioned by Jonathan Richardson (Jr.) in an account of his Grand Tour published in 1722. On his way to Rome Richardson visited the famous collection of Louis XIV’s cousin the Duc d’Orléans in the Palais Royal where the Holy Family by Night hung in the Cabinet du Lit Jaune. Richarson did not recognise the subject of the composition; he saw it as a genre piece. They are plain People and in a Cottage; and Nature and Humor must be instead of Grace, and Greatness; the Expression is exquisite; the Colouring warm, and transparent: a vast number of Parts put together with utmost Harmony; and for the Clair-Obscure it may stand in competition with the Notte of Correggio, or any other picture. In 1721, a year afer Richarson saw the painting, the French collector Coypel wrote that Rembrandt was one of few artists who withstood the harsh judgements of those who only admire Poussin, the father of French academism, though he could not refrain from stating that “[a painting] by Rembrandt with exact drawing and the knowledge of Poussin would be an admirable picture, above all, if painting it, he employed the artifice of his chiaroscuro”. It was indeed the use of light and shadow that was much praised in the Holy Family by Night even though the master was severely criticised for failing to follow the rules of the classic cannon and insisting that Nature should be an artist’s sole guide. The Holy Family by Night was also praised for its representation of daily life in the Netherlands without its biblical subject being recognised. A similar fate was shared by two Holy Family paintings formerly ascribed to Rembrandt and now to his workshop: The Holy Family with St Anne in the Louvre and the Holy Family with the Curtain in Kassel. These paintings simply lacked the “distinction, nobility and loftiness which are found in Italian paintings.” It would not do that the most holy family in history was depicted as “plain people”. In the 1727 catalogue of the Duc d’Orléans’ collection, Anne in our Holy Family by Night is even mistaken for a man (!) and the figure in the dark under the stairs is not mentioned, although admittedly he is extremely hard to make out. J.M.W. Turner, “The Unpaid Bill, or “The Dentist reproving his Son’s Prodigality” (1808), auctioned at Christie’s on 27 November 2002. Current whereabouts unknown. At the notorious sale of the Orleans collection in 1791 the Holy Family by Night was purchased by the collector and connoisseur Richard Payne Knight (1750-1824). He must have valued the painting because he even commissioned Turner to paint a pendant for it. Turner showed that he had studied Rembrandt: his own painting is a play of light and shadows (only this time with open shutters), using a similar thick impasto to render the light on the stucco walls. Again Turner’s subject shows that the painting was seen as a genre piece. 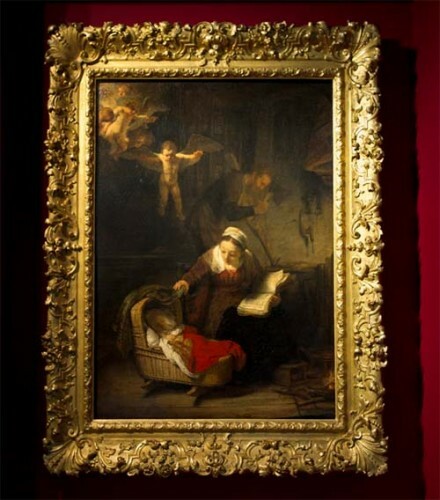 It was not until G.F. Waagen’s Treasures of art in Great Britain (1854) that the subject of “the Cradle” as our painting had become known was described as The Birth of Christ but that only contributed to the persistent tendency to see Rembrandt as a stubborn artist who only followed Nature and persisted in painting subjects from daily life even if they represented lofty religious subjects. In Horst Gerson’s revised edition (1969) of Abraham Bredius’ monumental Rembrandt oeuvre catalogue (1935) only those paintings he considered to be autograph were included. The Holy Family by Night was left out which caused a public outcry. Gerson defended his exclusion by pointing out that the difficulty of dating the painting related to questions regarding its authenticity: while the painting resembles Rembrandt’s manner of the 1640s in execution, the composition itself and the treatment of light and shade are much closer to Rembrandt’s style of the 1630s. This combination of different periods in the master’s style was, in Gerson’s opinion, typical for a studio work. A beautiful picture, but not by Rembrandt. The composition appears like a stage set, the planes are neatly parallel, one in front of the other. No cool tones are used and the detailed depiction of objects of lesser importance (for example the window) is unlike Rembrandt. The paint never has a dry grainy texture. The figures are too slim for Rembrandt and Anna’s features are finical. The hands are thin. What difference with the movement definition of space and power of colour of Rembrandt! the rigid panes parallel to each other in the composition and the rather clumsy construction of the staircase. Rembrandt’s interest in the subject of the Holy Family at the time when he painted the moving painting in the Hermitage is further illustrated by several drawings such as the one in the British Museum. The drawings and the painting no doubt had an impact on artists working in the workshop and those closely associated with it as can be seen from an almost identical copy of the drawing in the British Museum by a pupil. The intimacy of the Holy Family gathered around the Child in a domestic setting is also beautifully conveyed in Ferdinand Bol’s print dated 1645. The preliminary drawing for this print, incised for transfer to the plate, shows that Bol understood his master’s intentions very well. While these paintings, drawings and etchings differ in composition they also have certain motifs in common such as the wicker cradle: the one in the Amsterdam painting is virtually identical to the one in the Kassel painting and differs only in the Hermitage painting in that the latter has a hood. The position of the baby in the Holy Family by Night, too, is similar to that in the Hermitage painting. Whoever painted the Holy Family by Night also may have drawn inspiration from earlier Rembrandt prints such as Joseph Telling His Dreams (1638). There the figure at bottom right could have inspired the figure of the reading Mary, with her back to the viewer, the pages of the book brightly lit and her dark profile contrasting against the light she conceals. Scientific research shows that the ground layer of our painting does not differ from that applied in Rembrandt’s workshop. X-Rays show various small pentimenti, indicating that the Holy Family by Night was a free composition and not a faithful copy of a lost painting by the Master. The wicker basket, for instance, was first positioned in the center of the painting, just left of the window. It was overpainted and moved to the left. In Bol’s version it still hangs in the center. The various motifs “borrowed” from a variety of Rembrandt’s own works also point in the direction of a work from the workshop. Not a Rembrandt, but does it matter? In 1994, after the findings of the RRP dealt the final blow to the Holy Family by Night as an authentic Rembrandt, the Rijksmuseum removed the painting from view. The motivation to do so was that, in concurrence with the aim of the RRP, the museum wished to create a “clearer image of Rembrandt’s painted oeuvre” which negates the importance of the workshop. Yet the painting was and still is immensely popular with the public and around Christmas reproductions of it have always been the best selling postcard in the museum shop. Ironically, although they could not be more different, both the Holy Family by Night and the Man with the Golden Helmet in Berlin were demoted for the same reason: “too Rembrandtesque to be by Rembrandt”. 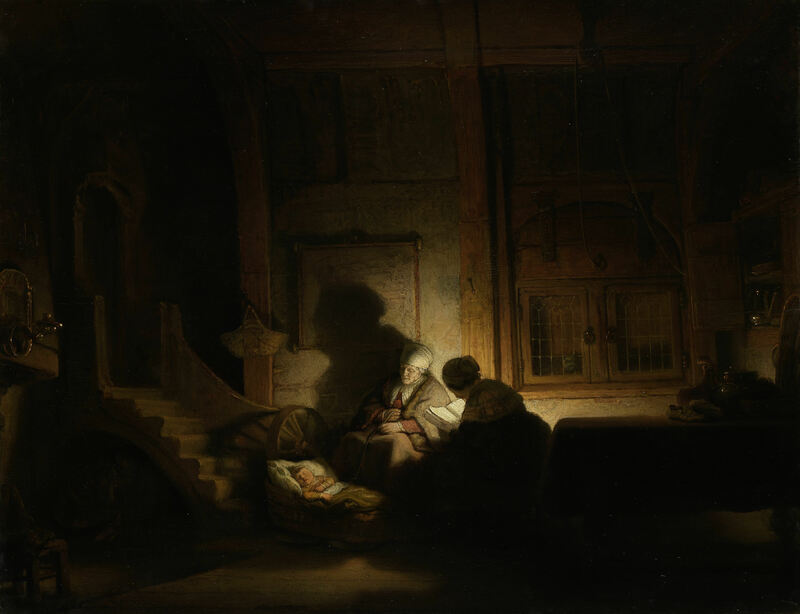 A painting like the Holy Family by Night that is so universally loved is loved not only because it is associated with Rembrandt but even more so because of its subject and the way in which it is rendered. It is also a testimony to the quality of the painters who worked in Rembrandt’s workshop. For those reasons it should remain on view. 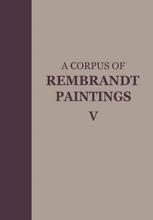 E. van de Wetering, A Corpus of Rembrandt Paintings, Vol. V, Springer, 2011.